A huge fire at a music festival in Spain forced the evacuation of over 20,000 concertgoers and incinerated the event’s stage in Barcelona, the regional government said Sunday. 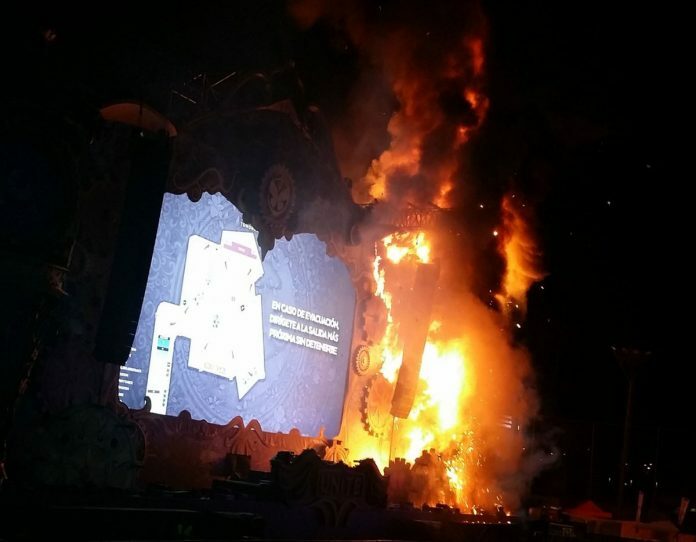 The fire Saturday night consumed the large outdoor stage at the “Tomorrowland” electronic music festival held at Barcelona’s Parc de Can Zam. Twelve firefighting units needed around an hour to extinguish the flames just before midnight. Barcelona firefighters said there were no serious injuries during the evacuation but the event’s private security treated 20 people for minor injuries or anxiety. Video images show the fire starting at the top of a tall temporary structure erected on the stage where a large screen showed a performer signing. The towering flames quickly spread until they engulfed the entire stage. The festival in Barcelona was one of several offshoots of a main “Tomorrowland” festival in Belgium. Organizers said the Barcelona event was canceled following the fire. Fans were forced to flee huge fire at Spain United Tomorrowland in Barcelona. No serious injuries during evacuation. Fire consumed the large outdoor stage.